Question: What makes a work of a particular artist memorable? What do the eyes see and transport to the mind's eye that makes a singular, perhaps memorable impression? This term is multi-faceted. One who makes an impression, stands out. He or She may be experienced by others as "impressive". Something fleeting - here and then gone, is registered momentarily as an "impression" by the mind or senses. This exhibition brings together 5 highly distinctive artists who, both in their process and in their outcomes impress upon their mediums and materials in ways that spark an impactful contact with their viewer, leaving a lasting impression in their hearts and minds. its expression impress upon their chosen medium makes contact with the viewer, making a lasting impression in their minds. Rugged Individualism - is an - essential quality in the -American spirit. For these five artists, it propels them forward on their uniquely original paths. Setting aside the loud voices of current fads, garish trends and latest fashions, they have focused on creating indelible work that stands on its own merit and enhances the further dialogue with contemporary art. These five artists whose work explores five different original and authentic paths all realize and reflect a uniquely powerful "Coming from Source" in their work and practice. Each is well aware of the many current trends, fads and fashions coursing through the art world today. It is to their credit that they don’t "take their eye off the ball" they're focused on or follow any of these. Instead, their work and practices independently embody the spirit of "Rugged Individualism" whose sensibility courses through the works in this exhibit. Their practices are guided by a long dedication to continuous evolution, mastery of their craft and a determination to follow their intuition with each new work they create. 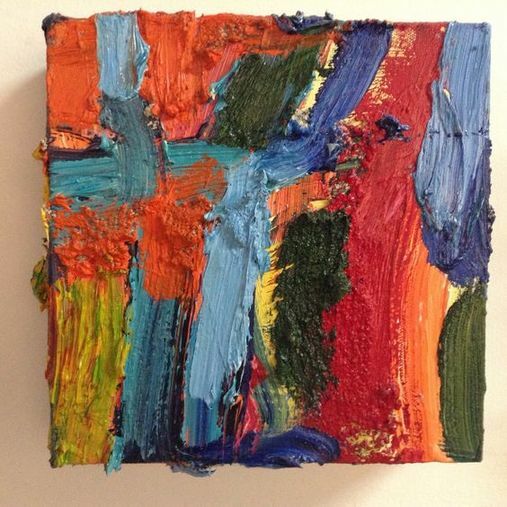 Encountering the boldly voluptuous colors in the small 12" x 12" panels by Chicago artist, Darrell Roberts, the work grabs hold of us with its dynamic application of paint, pumice and other materials. He draws inspiration from views of the city of Chicago before translating them into entirely abstract experiences that pulse with lines of interlacing color, surging in directions of exalted mark making. His ruggedly worked surfaces attest to an original expression of power and beauty as well as a dynamic originality. On his own terms, Darrell Roberts has created something wholly new, with a commanding logic all its own. Jordan Scott also pays great attention to his surfaces. Creating intricately, glowing designs from used postage stamps then finished in a perfectly clear resin. 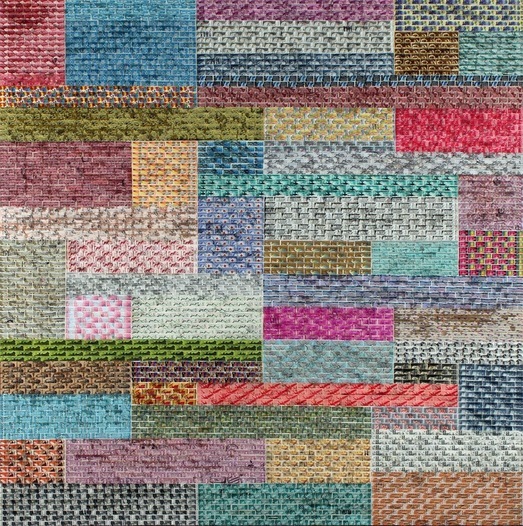 His imagined patterns - often based on mathematical theorems - are captivating on a number of levels. The cancelled postage stamps he employs suggest a huge diversity of locations, cultures and territories - conveying a universality both in the individual stories they tell and a universal fusion that comes together in the intricate arrangements he creates. 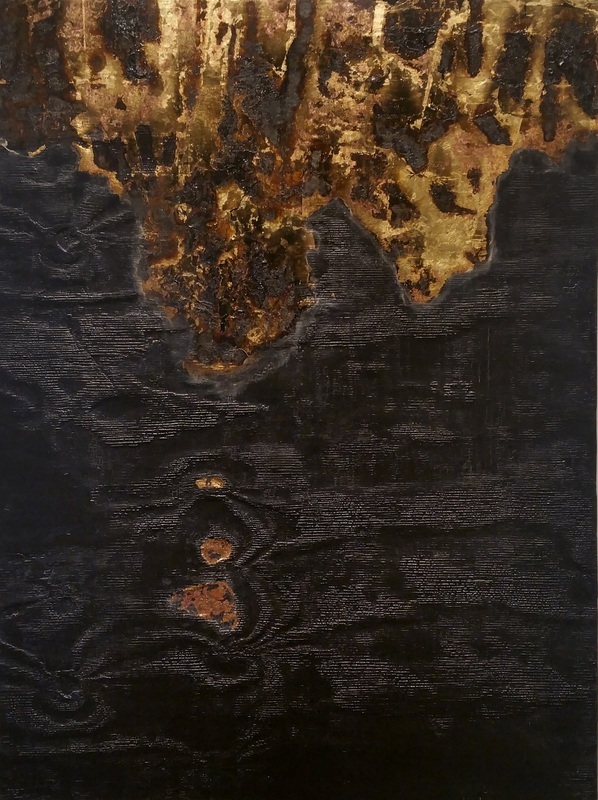 Doug Frohman's work is carried out using cement trowels to apply oil paint and encaustic on wood panels and canvas. The layered surfaces explore a “spatial architecture” that comes alive when broad areas of open color interact with smaller, more tightly choreographed, improvised sections. The artist conceives of the surface as a 360-degree spherical field rather than a flat surface, thus elevating the relational space between forms and open fields of color into metaphor. The artist's intent is to capture time's passing relativity and its layered histories in the interacting forms and spaces that influence each other over time. This metaphorical approach also extends to space. Whether Macro, where space is so vast, it is actually measured in the units of time (light years) it takes to reach a distant star or Micro, delving into the unseen world of sub-atomic pulses and charges, always combining and dissolving to miraculously produce the world we see all around us. Cleveland Dean's powerful, multi-disciplined work comes from a concentrated force of mind, as well as a uniquely bold approach to his materials. 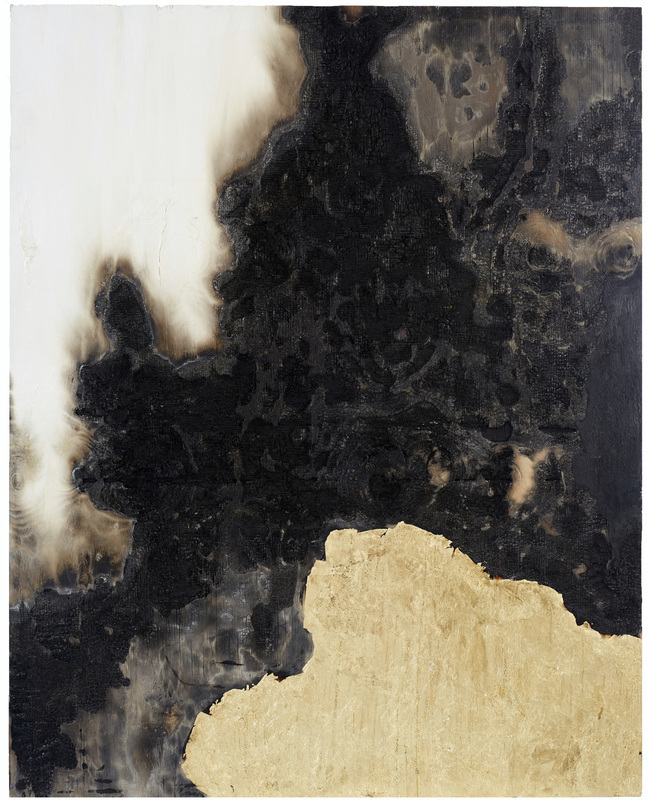 In his series "Apotheosis", the series relates to the Japanese tradition of Shou Sugi Ban. Shou Sugi Ban is a Japanese technique of burning wood to preserve the wood's structure. As utilized in this body of work this technique reflects personal turmoil, the awareness of the need for improvement and the layers which one needs to shed in order to be their better self. The burning is used to symbolize not only this new sense of self but also to preserve the lessons of the old self and how the old will always have its place in the new. The physical composition of these works may include materials such as metal, salt, twine/rope, paper, text, or other elements that all have a meaning relating to the ideal of the series. New York artist, Ford Crull creates dynamic fields of bold color filled with a wide array of historically and culturally significant symbols and language patterns from which he constructs his work. 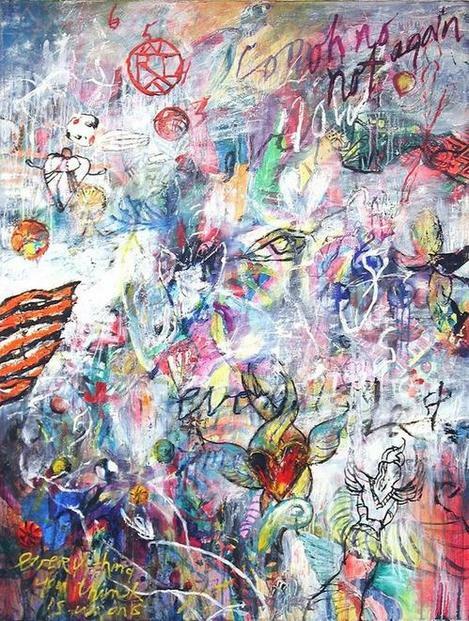 He employs scribbled words, phrases and recognizable symbols with an emphasis on a visual rather than a literal reading. As a result, he employs them inter-changeably in ways that create an intrinsic drama and mystery corresponding to a deeper part of ourselves – leaving interpretations open-ended and provocative. Darrell Roberts is a Chicago based artist represented by Thomas McCormick Gallery, Chicago. 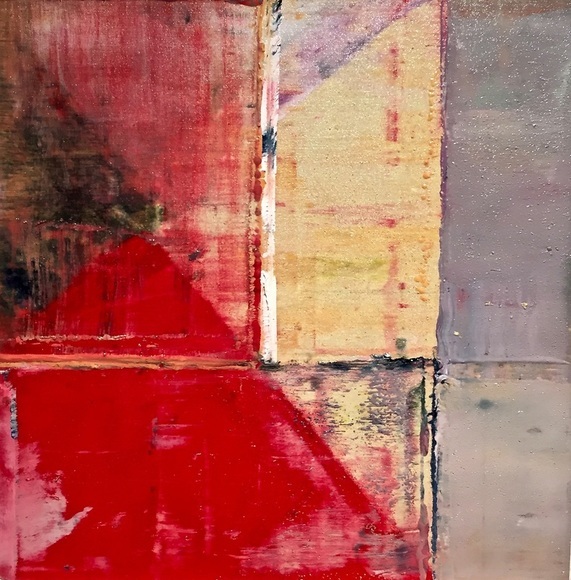 His artwork is full of intense colors and textures as he draws his influences from the lakefront path of Lake Michigan, the Chicago skyline and construction sites in the city. Darrell has a Bachelors in Art History from the University of Northern Iowa, a Bachelors of Fine Arts and Masters of Fine Arts in studio art from The School of the Art Institute of Chicago. Darrell Roberts is a painter’s painter. He is interested in the physical act of painting. Immersed in a life time of art history, Darrell responds, views and reacts to the mammoth wall size paintings of the 1950’s. By creating thick visceral paintings, Darrell squeezes those paintings down to 12″x12″ paintings which still have the same amount of power to capture the viewers attention in the same amount of wall space while having a contemporary painting feel. I often use, or reuse, materials outside their normal context and in ways that they were never intended. I work with a limited and repeating set of elements that are either identical or similar in nature, and can be accumulated and assembled in large numbers. 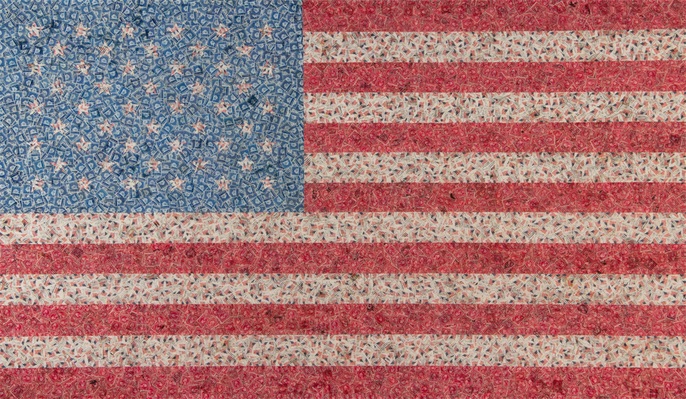 The stamp pieces are painstakingly put together from thousands of canceled postage stamps. Besides their obvious physical beauty, these pieces are interesting on many other levels as well. Previously used and canceled postage stamps, by their nature, are richly evocative. The many different types of cancellation marks and other imperfections beg several questions: Where did they originate? Who sent them? What letters did they carry? They each represent a person, or persons, and a past correspondence that remains a mystery. Each stamp has this hidden history of its own, and each represents a currency that carried a letter from a point of origin to its intended destination. Each small stamp represents this unknown story and, in addition, the expanded web of the larger life and context that it was once connected to. These artworks touch on both the individual and the collective, on both the original sender and the society as a whole. This current body of work is influenced, in part, by Carl Jung’s theory of the collective unconscious and the interconnectedness of the universe. The work of multi-disciplined, self-taught, visual artist Cleveland Dean exists to address the present quandary in abstract and conceptual works of art. He and his work expose that which is present - how we relate, what our thought processes have become and our place in this new multi-faceted yet increasingly isolation-based world. Cleveland pulls from various elements and life experiences and has formed an individual style that reflects his vision, including his studies of philosophy, sociology, psychology as well as his position as a clear-eyed observer of humanity. This centered ideology is deployed to stimulate individual thought in the viewer, as opposed to work that shocks, is propelled by gimmicky or a take-off of a take-off of another take-off. Producing this work takes original conception and concentration, in order to produce something truly original in the work. Cleveland's goal is to stimulate people to really see and think - gaining valuable knowledge that results in greater awareness to what's really going on around us. In society today, we are inundated with so much information that it becomes becomes nearly impossible to clear away the noise and distractions in order to see clearly and make informed decisions. With many of our civil liberties and freedoms disappearing right before our eyes, we must individually and collectively stem this tide by reversing these trends where the degradation of our intellect and loss of our freedoms goes on unabated. The urgency is real - the time is now. Utilizing the language of abstraction, my work draws upon an amalgam of minimalism, color-field and aspects of architecture. I tend to work thematically drawing upon a series of concepts while engaging with different materials, surface and themes. 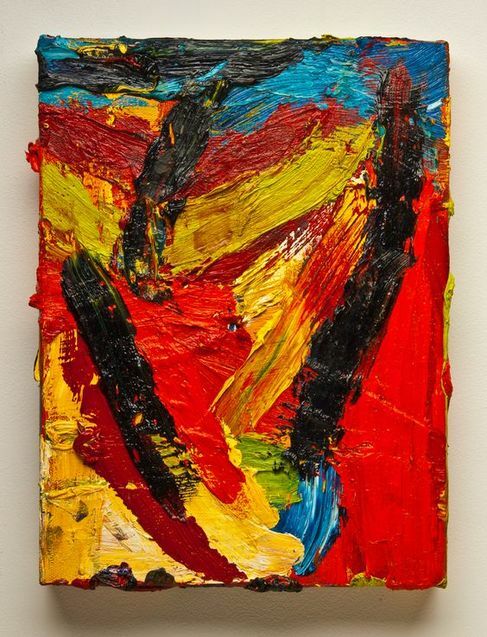 Since 2007, I switched from painting with brushes to using cement trowels of different sizes, experimenting extensively with different mediums and painting on hard wood panels instead of stretched canvas. The thicker, richer volume of paint and its application via the trowels multiplied my options, suggesting new ways of creating and “treating” the surface. From selectively-scraped passages revealing the work’s back-story and layered development to open fields of seductively smooth, glossy color, the added variety of paint handling and new surface treatments opened the way to more sophisticated and nuanced compositions. My past three series have been based around the square. From the series of four sequential panels and squares in “Abstract Narratives”, to the boldly-colored, large geometric squares of “Equations” to the small, individual panels of “Particles”, the square and its combinations has remained a constant in the work. Spatial architecture has emerged as a special focus in my current work. Re-conceiving the surface as a 3-D spherical space vs. a flat plane adds dimensionality to the relative position of the forms while increasing the dynamic tension they create. 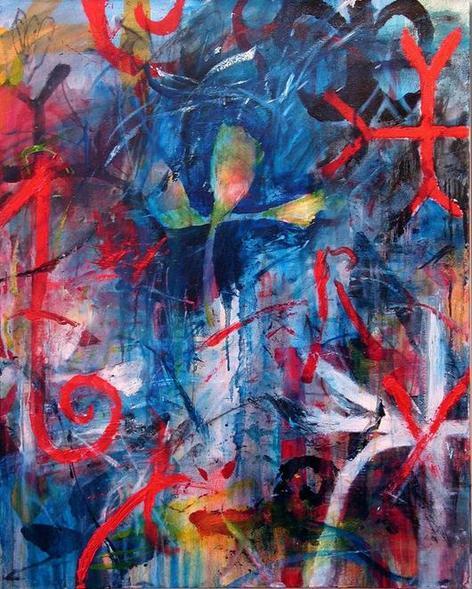 “The ambiguity of the image is central to my expression in art. The derivation of my symbols, pulled out from the oceanic flow of an unconscious, devolved dream state, reflects a necessity for metamorphosis and recombination that deprives the image of any safe haven. My images are involved in a perpetual dance, a narrative flow that destroys any preconceived notions or verbal meanings. The viewer is free to associate around the visual text which I present, supplying his own interpretations from his own experiences. ​There is a strong element of the diarist in the work, with each painting serving as a kind of painterly journal of reflections and reveries, set loose from their origins in specific events. In a wider sense, these paintings constitute a kind of intensive search to wrest meaning from anarchy of feeling. As meditations on emotional chaos, they enter into a world of competing impulses and simultaneous transmissions, seeking a resolution that is both cathartic and mysterious.